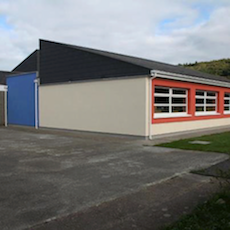 Public buildings within the community such as Glenealy Hall, Glenealy National School, and Kilbride Church are currently being repaired and upgraded to higher energy efficiency levels. 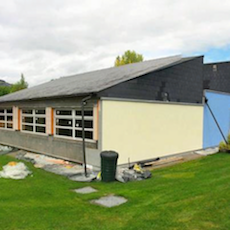 The case study retrofit project on St Joseph National School was completed by the end of August 2012. The retrofit works comprised of building fabric upgrades to the two classrooms situated in the back blocks of the school. A more energy efficient heat pump and low temperature radiators were also installed to serve these two classrooms. The building fabric upgrades included replacing the existing single glazed windows with triple glazed Passive Standard Windows. 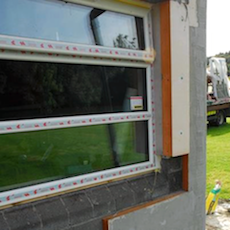 The existing cavity walls were pumped with blown bead insulation and additional external insulation was to be fixed to the external face of the building and rendered. This not only reduces heat losses but is also gives the facade a fresher and more interesting appearance. The result was not alone greatly reduced U-values, but it also gave the façade a fresher and more interesting appearance. The two classrooms were taken off the school heating system and are now heated by an air to water heat-pump. The heating load for this space has fallen by 50%. It’s hoped that as funds become available, the same approach will inform similar energy upgrades throughout the school. These works are expected to greatly reduce the current heat Load and heat demand saving the school in the long run in terms of running costs. The project was part funded by the Ballynagran Energy Plus Community funds. Supplier donations were received from Isover, Kingspan Renewables and Munster Joinery. The Community is very grateful for this assistance and would ask that people would consider products from these companies when retrofitting. It is possible that in the very near future the entire school will achieve Passive House certification. It has also featured in a recent issue of the magazine Construct Ireland! 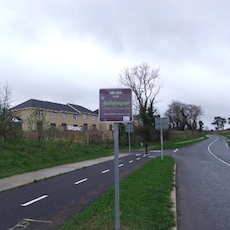 Keep a look out for the “Ballynagran Road Signs” which are going up around the community to inform motorists they are entering our Energy⁺ Plus Community! These are not just another way of publicizing the Ballynagran Energy Plus Project but also help to affirm and build solidarity. Hopefully, over the long term, a true sense of identification will emerge and the area will justifiably become well known for its innovative and positive approach to energy consumption and production. Certainly the Ballynagran Energy Plus Group believes that it is swimming with the tide! 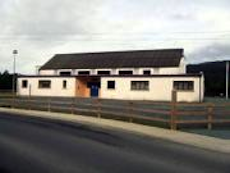 Glenealy Village Hall provides services to the wider area including Ballynagran and surrounding townlands. Below is a montage of some of the new signposts proposed for the Kilbride area. Notice – Ballynagran Energy Plus⁺ Wind Turbine Tour, Sat 9am, 6th Sept.